Happy 2 Grumpy, originally uploaded by Lukasmummy. Credits: Layered template (Tuesday Template, 23rd November 2010) by Connie Prince, Modern Christmas by Jaime Rhinehart (Cjoy2Day Designs) and Jewel Goodwin (Mad Genius Designs), Retail Therapy contributions (alpha, scatter and glitter) by Mad Genius Designs and Melissa Robinson (Melly Scraps) and Ribbon Mix by Miss Tiina. Font is DJB Lisa S Print by Darcy Baldwin. Journalling reads: At first when we put you into your Santa suit, you were all smiles. You liked the texture under your fingers and sitting in my chair. I was taking photos of you looking adorable and everything was perfectly fine. Then I decided to put the toy reindeer next to you, thinking it would be cute. You completely flipped out and started screaming. You ripped the hat off your head and threw it on the floor. You quickly went back to smiles again, just as soon as the Santa suit was removed! Cake, originally uploaded by Lukasmummy. Credits: Layered template (Everyday Templates, Template 4) by Laura White (C.W Picket & Company), Alphaset Templates Circle by Miss Tiina and Brrr Glitters, Brrr Patterns. 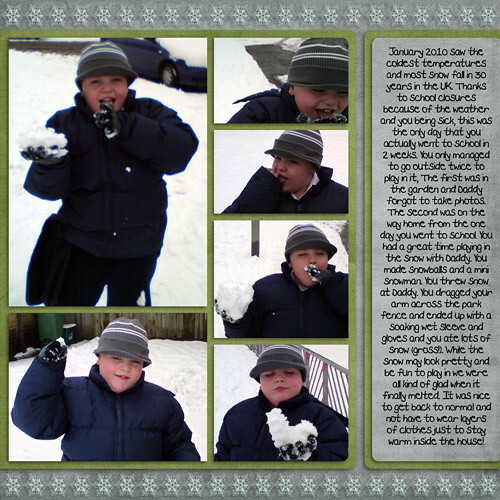 Brrr Craft Styles, Brrr Solids and Brrr Elements all by Jewel Goodwin (Mad Genius Designs). Font is 101! StaR StuDDeD. That’s Not A Toy, originally uploaded by Lukasmummy. Credits: Layered template (Template Challenge 9th May 2010) and Painted Edgers 04 by Katie Pertiet and P365 Roy G. Biv Fall (slightly recoloured), Project 365 Papers Roy G. Biv Solids and Dots (slightly recoloured) and Project 365 Papers The Basics. Fonts are Century Gothic, MTF Jotted by Miss Tiina and sf Tiscia’s Sloppy by Sugar Frog Fonts. Journalling reads: I’m not really sure why, you always prefer to play with my kitchen equipment instead of your own toys. No matter what it is I buy you it’s discarded in a few minutes if you bother to look at it at all. But show you my colander and you will sit for ages, sometimes an hour or longer, picking it up, putting stuff in it, trying to push things through the holes and of course your most favourite use of all, wearing it on your head like it’s a little hat! 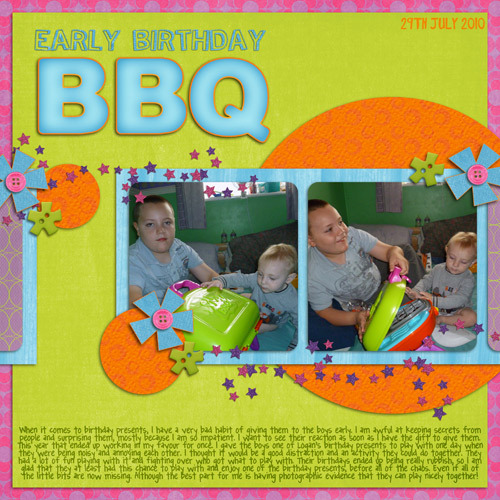 Early Birthday BBQ, originally uploaded by Lukasmummy. 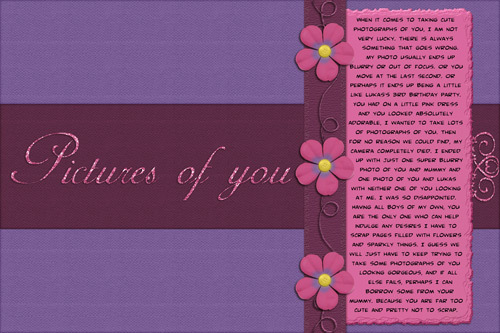 Credits:Layered template (Handy Helpers 2, Template 1) by Denise Tilley (DigiDesigns By Denise), I’m Funky by Jen C Designs and Tea Party At Georgia’s Glitters by Red Genius Enterprises (Jane Shaver and Jewel Goodwin. Fonts are MTF XOXOvo2.1 and MTF Toast by Miss Tiina and Pea Angedawn by Amanda Bottoms (Fonts For Peas). Journalling reads: When it comes to birthday presents, I have a very bad habit of giving them to the boys early. Iam awful at keeping secrets from people and surprising them, mostly because I am so impatient. I want to see their reaction as soon as I have the gift to give them. This year that ended up working in my favour for once. I gave the boys one of Logan’s birthday presents to play with one day when they were being noisy and annoying each other. I thought it would be a good distraction and an activity they could do together. They had a lot of fun playing with it and fighting over who got what to play with. Their birthdays ended up being really rubbish, so I am glad that they at least had this chance to play with and enjoy one of the birthday presents, before all of the chaos. Even if all of the little bits are now missing. Although the best part for me is having photographic evidence that they can play nicely together! 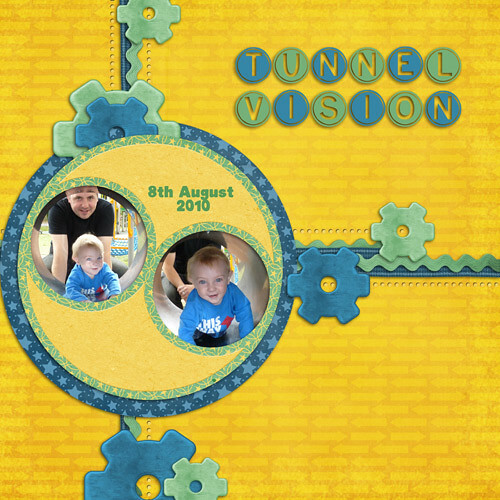 Tunnel Vision, originally uploaded by Lukasmummy. 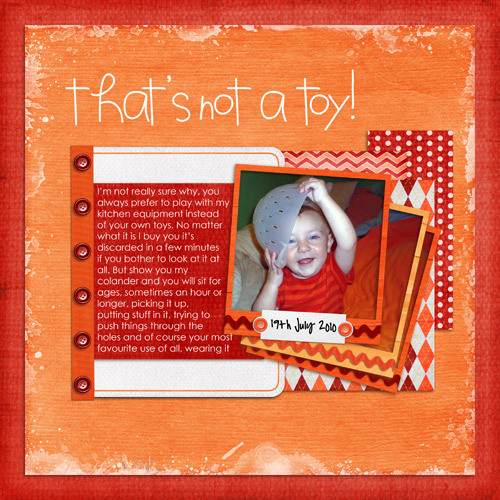 Credits: Layered template (On The Grid, Template 4) by Denise Tilley (DigiDesigns By Denise) and I’m All Boy by Jen C Designs. 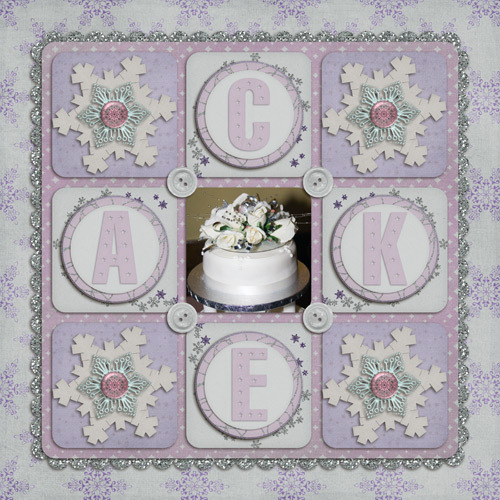 Fonts are MTF Chubb by Miss Tiina and sf On The Dot by Sugar Frog Fonts. Cargo Net, originally uploaded by Lukasmummy. Credits: Layered template (Blocked Out, Template 2) by Denise Tilley (DigiDesigns by Denise) and I’m All Boy by Jen C Designs. Font is MTF Hello Again by Miss Tiina. 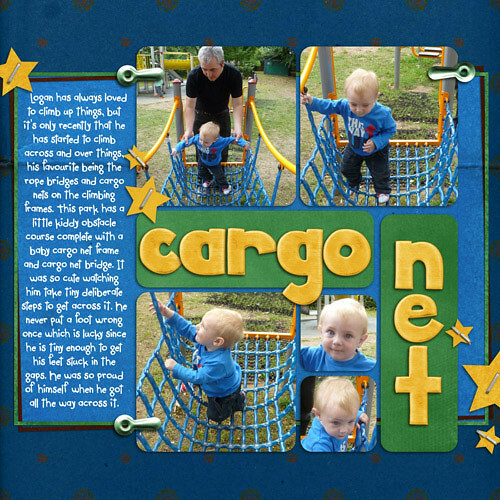 Journalling reads: Logan has always loved to climb up things, but it’s only recently that he has started to climb across and over things, his favourite being the rope bridges and cargo nets on the climbing frames. This park has a little kiddy obstacle course complete with a baby cargo net frame and cargo net bridge. It was so cute watching him take tiny deliberate steps to get across it. He never put a foot wrong once which is lucky since he is tiny enough to get his feet stuck in the gaps. He was so proud of himself when he got all the way across it. Pictures Of You, originally uploaded by Lukasmummy. Credits: Splendid Summer Mega kit contributions by Mandymade, Jaime Rhinehart (Cjoy2Day Designs), Paper Planes Designs and Laura White (C.W Picket & Company), Floral Swirls Brushes by Miss Tiina and Simple Tear Action by Atomic Cupcake. Fonts are AdineKirnberg-Script and Comic Book Commando. Journalling reads: When it comes to taking cute photographs of you, I am not very lucky. There is always something that goes wrong. My photo usually ends up blurry or out of focus. Or you move at the last second. Or perhaps it ends up being a little like Lukas’s 3rd birthday party. You had on a little pink dress and you looked absolutely adorable, I wanted to take lots of photographs of you. Then for no reason we could find, my camera completely died. I ended up with just one super blurry photo of you and mummy and one photo of you and Lukas with neither one of you looking at me. I was so disappointed. Having all boys of my own, you are the only one who can help indulge any desires I have to scrap pages filled with flowers and sparkly things. I guess we will just have to keep trying to take some photographs of you looking gorgeous, and if all else fails, perhaps I can borrow some from your mummy. Because you are far too cute and pretty not to scrap.